Although ice cream is often associated with the lazy days of summer, who could possibly refuse a scoop even in the depths of winter? So many flavors, so little time. 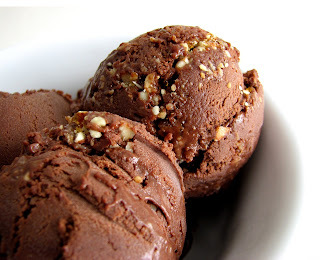 Ice cream is one of those immense culinary pleasures that when freshly homemade is total nirvana. I set out to marry a deep bittersweet chocolate flavor with the special warmth of spices and the super bling of caramelized almonds. This is the happy result. There are so many wonderful spice combinations that go well with chocolate and I think cinnamon and star anise are among the most well-suited. They seem to bring out the earthy richness and complexity of the cocoa bean and enrich the natural depth of bittersweet. I added caramelized almond powder - called praliné in the parlance of pastry - to lend some crunchy texture and another layer of earthiness from the nuts and amber caramel. I think you will find this combination irresistible. This ice cream is for serious chocolate lovers. It’s incredibly delicious without being heavy. It has just the perfect amount of sweetness that won’t mask or override the flavor of the chocolate or the spices. Once you’ve had a taste of this, I think you’ll agree. This is absolute pure luxury. - I used Callebaut bittersweet chocolate. It’s very good with Trader Joe’s bulk chocolate as well. Just be sure it’s bittersweet. - When making the praliné, stir gently. Too much vigorous stirring will cause the mixture to crystallize. The toasting of almonds and darkening of the caramel take just a minute or two. Praliné powder can be kept in an airtight container in your refrigerator for a very long period of time. - Let the spices steep until the flavor is fairly strong. Remember, the bittersweet chocolate will combine to tone it down. I let the base chill overnight to allow time for the flavors to marry. - The rum rounds out all the flavors beautifully without the final product tasting of alcohol. To make the praliné, place the sugar in a saucepan with just enough water to cover. Bring to a boil without stirring until the sugar begins to caramelize and takes on the color of light honey. Turn the heat down to low and add the almonds. Stir gently with a wooden spoon to coat and cook until the almonds are toasted and the caramel begins to turn the color of amber. Take off the heat immediately and pour mixture onto a silpat-lined or lightly oiled baking sheet. Cool until firm, about 15-20 minutes. Break the praliné into small pieces and grind in a food processor until powdery. For the ice cream, heat the 2 cups of milk with the sugar and salt until dissolved. Add the cinnamon and star anise and simmer for a couple of minutes. Take off the heat, cover and steep for about 30 – 45 minutes or until it has the desired strength. Chop the chocolate into small pieces. Combine with the heavy cream and warm over bain marie until chocolate is melted. Remove from heat and stir until smooth. Set aside. Remove the cinnamon stick and the star anise and re-warm the spice milk mixture. Whisk eggs yolks and add some of the warm milk to temper the mixture, whisking constantly. Pour the yolk mixture into the remaining warm milk, whisk together and return to low heat. Cook, stirring constantly with a spoon, until the custard coats the back of the spoon and a finger traced through it leaves a clean track. Strain immediately into the chocolate mixture and stir to combine. Blend in the rum. Cool and refrigerate until thoroughly chilled. Freeze according to your machine’s directions. Pour the ice cream into a clean airtight container and fold in the praliné. Press a piece of plastic wrap into the surface of the ice cream, cover and place in your freezer to firm up a bit. I love the combination of chocolate and spices! I've been following your blog for a while and love your posts- I think we have a lot of the same tastes/ views on desserts. Keep up the great work! Thanks for your comments on my blog... re: cornbread I'll have to try the moosewood version. I think one of the reasons the mixes come out so well is because of all the sugar. I'm usually trying to reduce the sugar and that's probably one of the reasons I haven't come close to the mixes! This looks incredible! I've been meaning to make more ice creams with my new mixer, and this sounds perfect. Thanks for sharing! This is wonderful, my family loves ice cream anytime of the year. I love the crunch from the praline, this is absolutley sinful! 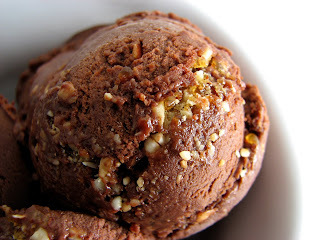 I'm usually not a chocolate ice cream lover, but there's something about this recipe that makes me really want to try it! That ice cream looks and sounds so good! oh gayle... you are killing me. for an ice cream junkie like me, this is heaven! 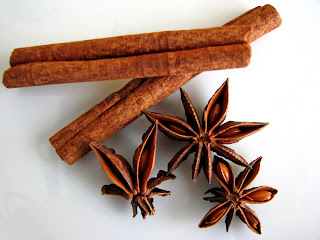 Star anise and cinnamon would be amazing with bittersweet chocolate. I love how this ice cream sounds. Can't wait to try I love star anise. I am drooling over here! This looks just dreamy. I love the addition of spice! You've inspired me buy a pint on my way home from work tonight! I need to clear out some space in my freezer for my ice cream maker!!!!! Thank you for a beautiful post! 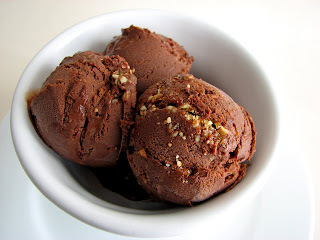 I liked it so much I've included in my salute to Chocolate post "12 Hot Ice Cream Recipes You Need to Try"
I look forward to many other wonderful recipes.